As the Twitter hashtag turns 10 years old, I’ve been taking a look at the purpose of a hashtag on social media and how we should be using them. Hashtags are conversation drivers – they’re designed to link users to others who are interested in or talking about the same topic. By clicking on a hashtag on Twitter, Facebook or Instagram, you’ll be taken to a whole host of other posts which also include that hashtag. When you include a hashtag in a post, your visibility is greatly increased and it’s one of the only ways to increase your reach to others outside your own audience without having to invest in paid for content. Should I use hashtags on Facebook? I’m often asked this question and the jury is still out. Again, hashtags on Facebook are designed to link you to other users and in theory should make you more visible. However, hashtags only really work if the audience understand the purpose of them and I don’t think this is the case on Facebook. If you’re using a specific hashtag for a campaign which has been rolled out across other social platforms, it makes sense to use the hashtag on Facebook to show brand unity. Using hashtags will not be the key to your Facebook success but there’s nothing to lose by including the occasional #MondayMotivation. Don’t go overboard and hashtag everything – it puts users off. Instead, just pick out a couple of key words. 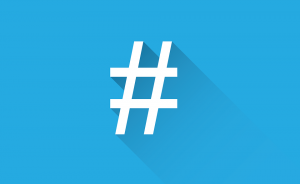 Consider whether your hashtag will be seen – search for your hashtag first to check others are using it. Create a specific hashtag for people to use at your event – this gives you a simple way of checking what other people are saying about your event across social media. Piggyback on popular hashtags – Using hashtags such as #WednesdayWisdom and #ThrowbackThursday increases your reach. Check your trending hashtags on Twitter and see whether any of these could be applied to your tweets. Happy Birthday Twitter hashtags. Now it’s your turn to go out and use them. By Ellie Banahan| 2017-08-23T12:21:22+00:00	August 23rd, 2017|Uncategorized|Comments Off on It’s all about the hashtag.